I fell in love with kale chips last summer. I had grown kale in my garden and had an abundance, so I decided to try my hand at the healthy snack that I kept hearing about. However, I never really got to eat very many of the ones I made. Unfortunately the day I decided to make them was the day after we had to rush our dog Derby to the emergency animal hospital, she had to stay the night so they could run tests and give her fluids. At the time I started making the chips, I was waiting to hear some good news about our little girl, so I was trying to pass the time and keep my mind busy since I couldn’t help but think the worst and just sit at home crying. Cooking and baking always provides that escape for me, a great way to “get away” and just create in the kitchen. Little did I know that by making those silly little kale chips on that very day, I would never ever be able to look at them the same way again. I have found, at least for me, that food is always a great reminder of past times. Good or bad. The simple smell or taste of a dish can take you back to being a kid, remind you of a loved one, an amazing dinner party and so many other things. While that first batch of kale chips were baking last summer, my phone rang and it was the vet, they told me Derby had taken a turn for the worse and that we should come right there. After a series of many, many tests and an emergency surgery, Derby passed away later that same night. It was all so quick and it was all so completely unexpected. The kale chips sat on top of my stove, on the very pan they were baked on, for days. I couldn’t eat them, I had no appetite, but for some reason I couldn’t throw them out either. They reminded me of a time when I had hope that Derby was going to make it, I was baking them to pass the time until the vet called to say I could pick her up. I eventually threw the chips out, but I had been unable to make them since, which I know sounds totally crazy, but it was true. The mere thought of making them could just bring on the tears. I know this is a completely, ridiculously sad back story for a food blog post about silly old kale chips, but I didn’t feel honest telling some wonderful and happy story about how I came to make these kale chips, it just didn’t feel right. I honestly kept thinking about what I would write when I was making them. I finally made the chips now, because after the one year anniversary of Derby’s death passed us in July, I promised myself that I would find the time to make these again. It most likely sounds silly to you, but I just wanted to wait and do it when I felt like I could handle it. I didn’t want to get over it or forget, I just wanted to be able to handle it and grow from it. I know, they are just kale chips, but it was about the healing for me. The other ironic part about the kale that I planted and grew last summer, is that it somehow lived under the 3+ feet of snow the covered my garden this winter. At the first major melt, this past spring, the plant peaked through what snow was left and it was still green somehow with leaves still on it and immediately began growing again. Once the snow had melted and our new puppy Seri could get into the garden, she made a B-line for the kale and would steal the leaves off the plant and run around the yard, eating as much as she could. That dog absolutely loves kale. So much so, that many times she prefers that to any fancy meat treats we buy her. The entire time I was cutting up the raw kale to make these chips, Seri was under my feet, looking at me, waiting for any bit to fall. It was exactly what I needed. Maybe it wasn’t irony at all. These chips are a perfectly crispy and healthy snack that is perfect for all you chip lovers. I personally have always loved a good crunchy or crispy savory snack. I honestly could eat an entire bag of kettle chips in one sitting, if I didn’t know better. Thank god I do. The kale chips are light and airy and you don’t even get a hint of the bitterness that kale can be known for. They are a tad bit spicy, the flavor from the curry is so perfect and the coconut flavor is very subtle but I felt like it would round it all out nicely. If you don’t like spicy, leave out the cayenne pepper or you can even leave out the curry powder and coconut flour and just go with a little freshly ground black pepper and kosher salt. Honestly, the flavor possibilities with kale chips are endless. You could use garlic powder, smoked paprika, cumin, etc. If you aren’t vegan, parmesan cheese would also be delicious on these. Play around. You will definitely be addicted once you make these, so you’ll have plenty of opportunities to try different flavors. Preheat oven to 375º F. Clean the kale very good, after removing the stems and tearing into bite sized pieces, allow the kale to air dry or spin it dry in your salad spinner. Lay the dry kale pieces in a single layer on two baking sheets (you may need more or less baking sheets depending on how much kale you have). Since I had two baking sheets covered in kale, I drizzled one tablespoon of olive oil over each. Toss the kale around with your hands to evenly coat it all in the olive oil. In a small bowl mix together the curry powder, coconut flour, cayenne pepper and sea salt. Sprinkle half of the spice mixture over one pan and half over the other. Toss the kale gently with your hands to evenly distribute the spices. Place the pans in the oven and bake for approximately 15 minutes until the edges of the kale pieces are brown and they are crispy. Keep an eye on them. Be careful not to burn them. Once done, place the baking sheet on a rack to allow it to cool. I find storing the kale chips in a tightly closed paper bag, the best way to make sure they remain crispy. FYI – kale chips are also wonderful crumbled up and sprinkled over popcorn. So sorry about your dog. For the first time in my life, we are petless, and although I miss the companionship, I don’t miss the gut wrenching heart ache and worry. Kale chips are delicious and are packed with all sorts of amazing nutrition. Thanks Eva, it was definitely one of the most difficult things I have ever had to experience, but thankfully all of the wonderful moments we shared together outweighs that for me, already! I just now have finally gotten to read this article cried through the entire thing. I remember the sad time when you lost Derby. It was definitely a hard time Nana, I honestly cannot believe it has been over a year already, it seems like only last week in some ways! Ironically today is the one year anniversary of when we got Seri, maybe I will give her some kale to celebrate haha. 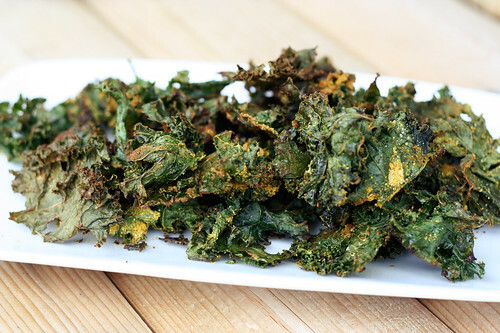 Let me know what you think of these kale chips – they are one of my favorite snacks!